Baking fish in parchment paper or tin foil—known in France and gourmet cooking circles as en papillote—steams the fish with a minimum of fuss and equipment. 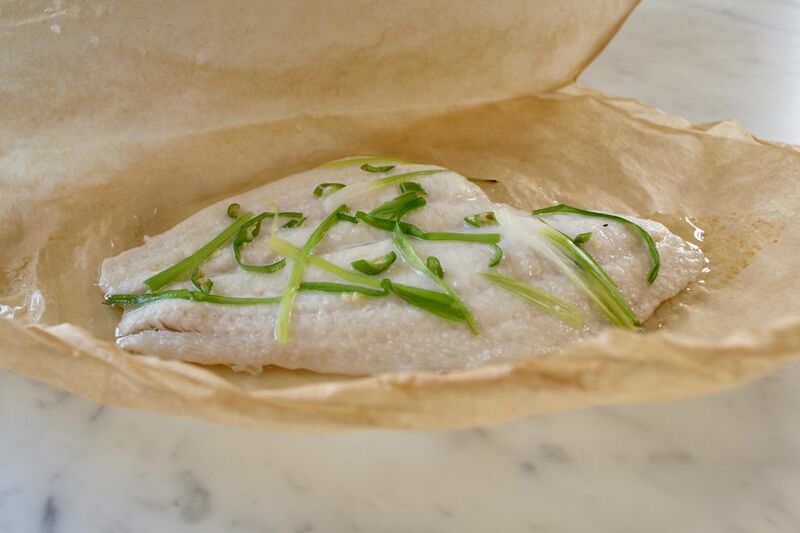 Delicate fish—sole (as pictured) and other thin white fish—is particularly delicious cooked in parchment packets since it cooks gently and stays moist. Any fish, however, can (and should!) be cooked using this method because fish essentially steams in its own juices, is difficult to overcook, and ends with the easiest clean-up in the world. To get started, heat an oven to 400 F.
Next, lay one serving of fish and its seasonings on one-half of a large sheet of parchment paper or tin foil. The sheet should be about 18 inches long. Note: If you like, you can fold the parchment or foil before putting the fish on it and cut it into a heart shape for a more elegant presentation. Prepare one serving packet per person. Now add seasonings. You can simply use salt and pepper, or add small, thinly sliced or shredded vegetables like carrot, zucchini, or peas. Herbs like basil, cilantro, or thyme are also nice additions. This cooking method allows much flexibility, so add what sounds good to you, but just make sure that whatever you add requires the same cooking time as the fish you're using. 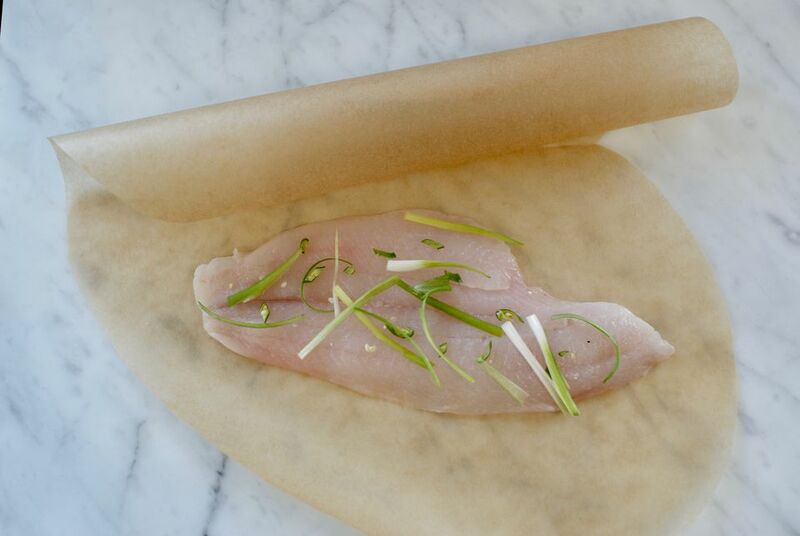 Pictured here is petrale sole with thinly slivered green onions and finely chopped fresh chile, all sprinkled with a bit of salt and a drizzle of toasted sesame oil in a piece of unbleached parchment cut into a heart shape. Fold the parchment or foil over the fish. Fold or crimp the edges to seal the packet. Put the packets on baking sheets for easier handling. Bake until the fish is opaque and flakey...oh wait, it's sealed, isn't it? How will you be able to tell when the fish is cooked? Easy: bake for 10 minutes minimum and 15 minutes per inch of thickness if you're working with thicker pieces of fish. If you've used white parchment paper and you've sealed it perfectly, the packet will not only brown attractively but it will also puff up a bit in the oven. Don't fret if this doesn't happen—the fish will still be delicious. If it does happen, try to get everyone's attention right away, because the packet(s) will deflate almost the minute you take them out of the oven. You can serve the packets at the table (transferring the packets to plates first!) and let everyone open theirs up to experience that first burst of delicious aroma. Or, if you used tin foil or don't want a bunch of damp parchment paper at the table, you can unwrap the fish in the kitchen and serve it. Just be sure to serve it immediately so the fish is still hot and fragrant with whatever you've seasoned it with. Pour any juices in the packets back onto the fish for maximum flavor.